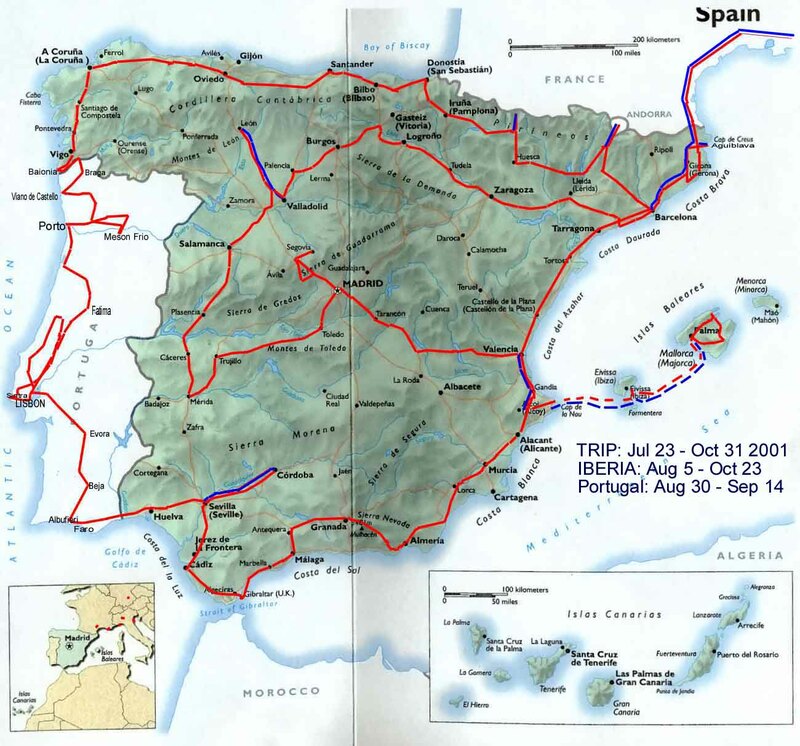 We left Zaragoza at 2:50 PM and Marcia drove the 172 miles to the beach city of Sitges, which is 25 miles south of Barcelona on the Costa Durado. We went here first because this is the place Jairo said he wanted to take us to but we wound up never having time to go. This is known as the “gay beach” city (ala Laguna Beach) and is supposed to be special. We got there at 5:20 and parked in the underground city parking lot and then wended our way to the beach through the touristy old city. We found a lovely little spot on the beach, Bar Chiringuita, to have a cortado and tea and then wandered up the beach watching the sun set, it was very lovely. Walking back through the old city, we got some gelatos which were very good. A pin and postcards and we were ready to go. We got the car out and Marcia drove the 25 miles on the coast freeway to Barcelona. We felt pretty familiar driving into the outskirts of this town and knew our way in. Manuel had booked us at a different hotel this time, the Hotel Nuñez Urgel (name of an old king of Navarra) at 232 C/Comte de Urgel. We arrived at 7:50, checked in, unpacked and at 9 we caught a cab to Psg Gracia and found the place I had tried on our first visit, Tapa Tapa. This place could be likened to Spanish Tapas McDonalds style. All the stuff is laid out in cabinets for you to view and the paper place mat has photos and descriptions of each of the 50 different items you can order either as a tapas or as a full dish (ración). After ordering a bottle of rioja and Vichy Catalan we started out with 3 appetizer things each. Then we each ordered 4 more tapas each and finally a postres. Overall it was very good but not one of the individual items were as good as we have had at regular tapas bars. It was a well-organized place and they were geared to making you happy, so we enjoyed the experience. We left there at 11 and headed for Plaza Catalunya, the largest one in the city (2nd only to Red Square in Europe) which is at the end of Las Ramblas. It only took a couple of blocks and then Marcia discovered the Hard Rock Cafe and was determined to do some shopping. So I went in and had a beer and discovered that the Hard Rocks are an English concern and the bartender was very inattentive, letting me sit there almost a half hour before taking my order. Marcia joined me and we had a drink while watching tennis on the telly. Bar owners think everyone is interested in every sport event that occurs on the planet (and they provide it). I noted a very attractive tennis player named Jalena Dokic, whom I had never heard of. Since Marcia had bought plenty in their tourist shop, it was time to head home so we caught a cab out front after waiting 15 minutes in a line and got back to the hotel and to bed by 2 AM. Woke at 10:30 and by noon I was having a cortado in the lobby bar and worked on the computer, then showered and by 3:30 we were in a cab heading to the one thing we missed in Barcelona, Snowflake. We arrived at the Barcelona Zoo which is on the land that used to contain the fortifications that kept an eye on the city. When the yoke was thrown off they tore it down and built a beautiful park (Parc de la Ciutadella), the Parliament building and the zoo. We headed straight for the apes and finally found her. Snowflake is the only pure white albino gorilla in existence. Only here in Barcelona. She was very active and it was interesting to see her but Marcia was put off by her bad habits. We then explored the rest of the animals and what made this zoo for me better than all the others I have been to (including San Diego) is that all the animals were awake, walking around or doing something rather than rolled up in a ball hiding behind something. They all seemed contented and happy and it was very pleasant walking among them. We decided to see the whole place and spend the day here so we saw seals, bears, lions, elephants, giraffes, zebras, gnus, buffalo, llamas, camels and the usual variety of gazelles and ibex. The ibex was very friendly and let me pet him. After I walked away, he jumped up on the wall calling me back for more, so I did. We found the reptile house which they charged extra for and went in. Like the others, all the snakes were awake, moving, drinking water and sticking their tongues out. They would see you and come right up to the glass and look at you, very spooky. We left the zoo around 6 and walked to the other side of the area where the City Park is to see the huge Monument and the lake in front of the Catalan Parliament building. The monument was huge with multiple dragon fountains spouting water in all directions. It was quite impressive. We caught a cab back to the hotel and I changed for my run. At 7:40 I headed out and ran down Comte Urgel which I had run the last time I was here form the Meliá Hotel, so I had to run further toward the Sea. On the way back I stopped at the Internet place I had seen before and they charged me $5 in advance to join their club. Trying to sign on I discover that AOL has cut me off for the 3rd time so I use the cell phone to call AOL in the US. After waiting on hold a live voice comes on and as she is asking me my name, the money on the cell phone runs out and the call ends. Needless to say this triple whammy aggravated me and the guy couldn't give me my money back. On top of that, before I left Marcia told me to check the 2nd floor at the hotel where she thought she saw some computers. Of course I forgot to do that but remembered after I returned. Sure enough, the hotel has 2 computers useable 24/7 for free internet use. When I got to the room I used Marcia's phone to call AOL and they gave me a new password. I went down to the hotel computer and sent out Chapter 45. Irene had driven her Mustang from Madrid to Barcelona because she is moving here and getting her new apartment ready. She met us in the lobby bar at 9:20 for a glass of tinto and then we took a cab to Barceloneta on the shore. We joined Jairo at the Reial Club and he treated us to a wonderful "bon voyage" dinner. For starters, I had a shrimp salad and Marcia had sopa pescadore and then we both had a veal tenderloin. It was all very good and after espressos we went across the street to Marmagnum, one of several go-go clubs and danced a little. We said our thanks and good-bye to Jairo and then Irene took us by cab to see the CIBA Vision headquarters where she will be stationed and then back to the hotel. It was midnight and I spent until 5 AM finishing up all my email which was tedious. Since it was free and comfortable this was the best time to get it done. After going to bed at 5, I awoke at 11, had a cortado at the bar at noon and finished the last of the email since I can't do it all at once for fear of being shut off again. By 1 PM I did my same run down Urgel but on the way back I took a different route and wound up in front of an El Corte Ingles which reminded me I had never bought the Spanish games I planned on doing for my collection at the end of the trip. With a little help from a very nice lady in the store, I found the exact games (2) I wanted and headed back to the hotel. I checked out of the hotel at 2 and then tried to call Marcia. Since there was no sense adding money to the phone's Spanish chip, I used the emergency phone card I had in a phone booth. She didn't answer so I waited in the hotel lobby until she arrived from her prolonged lunch and worked the computer. It was the only time I got nervous about where she was. I also did some resends on the internet and she arrived at 3:30. Since I had already lugged all our bags to the lobby we just had to get the car out of the garage and pack it again. How are we ever going to get those big game boxes packed when we go home? There was a feeling of sadness as we drove out of Barcelona, I will really miss this beautiful city. Marcia drove and we took the freeway north heading for the French border. We planned on doing the tax-free business at the border and stopped at a place there that led us to believe we could do it also in Milano so we kept going. We crossed the border, seeing the Aztec monument that we saw when we drove into Spain almost 3 months ago. Marcia drove 294 miles and into France and finally turned it over to me after we stopped at a gas station and bought some snacks at 8 PM. We really have said good-bye to España and Iberia but we have the feeling we will be back.